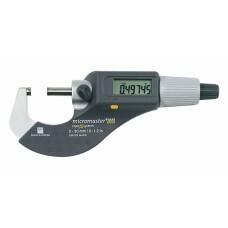 Micrometers are a very popular precision measuring tool. While not as versatile as a caliper, micrometers have 10X the accuracy (depending on ranges). 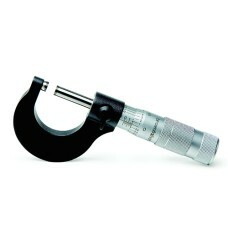 Gaging.com carries all Brown and Sharpe Micrometers at discounted pricing. If you are looking for a particular style that we do not have on the website, please let us know. We will gladly locate the item for you. The 00160201 Brown & Sharpe Micrometer Stand is on sale at Gaging.com! Call S..
0320001 Brown & Sharpe Tesamaster Precision Micrometer 0-1"
The 0320001 Brown & Sharpe Tesamaster Precision Micrometer 0-1" is on sale at Gaging.com. Measure Sm.. The 072109837 Brown & Sharpe Micro-Etalon 225 Micrometer 0-1"/0-25mm with Standard Inserts is on sal.. The 072109843 Brown & Sharpe Micro-Etalon 225 Micrometer 1-2"/25-50mm with Standard Inserts is on sa.. The 072109857 Brown & Sharpe Micro-Etalon 225 Micrometer 0-.800" with Pointed Inserts is on sale at ..
599-1-44 Brown & Sharpe Value-Line Micrometers Inch 0-1"
Brown & Sharpe micrometers continue as the standard wherever measuring consistency is vital. Fe..
599-2-44 Brown & Sharpe Value-Line Micrometers Inch 1-2"
599-4-44 Brown & Sharpe Value-Line Micrometers Inch 3-4"
599-5-44 Brown & Sharpe Value-Line Micrometers Inch 4-5"
599-6-44 Brown & Sharpe Value-Line Micrometers Inch 5-6"
00180070 Brown & Sharpe Enamel Frame Micrometer 0-1"
*product shown may differ The 00180070 Brown & Sharpe Enamel Frame Micrometer 0-1" is on sale at ..
00180071 Brown & Sharpe Enamel Frame Micrometer 1-2"
*product shown may differ The 00180071 Brown & Sharpe Enamel Frame Micrometer 1-2" is on sale at ..
00180072 Brown & Sharpe Enamel Frame Micrometer 2-3"
*product shown may differ The 00180072 Brown & Sharpe Enamel Frame Micrometer 2-3" is on sale at ..
00180073 Brown & Sharpe Enamel Frame Micrometer 3-4"
*product shown may differ The 00180073 Brown & Sharpe Enamel Frame Micrometer 3-4" is on sale at .. 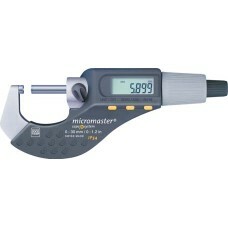 The 599-100 Brown & Sharpe Micromaster Easy Micrometer 0-1.2" / 0-30mm is on sale at Gaging.com!.. *product shown may differ The 599-125RS Tesa/Brown & Sharpe Micromaster IP54 with RS-232 Electron..